The X53/2 parts washing system is engineered for cleaning washing applications that require wash and rinse cycle. The operation principle is based on a fixed platform on which the parts are placed, and a series of angled water jet nozzles that are configured on a spray ramp optimally wash and rinse all the areas of the parts needed to be cleaned. The wash and rinse stages are controlled by PLC control operation that prevent cross contamination in the tanks. The turntable removes easily from the wash system on to a mobile cart for easy loading and unloading. 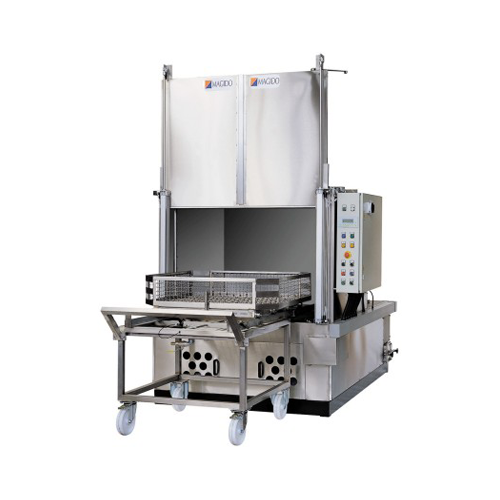 The X53/2 series is constructed of AISI 304 stainless steel with additional options available for filtration, multiple tank rinsing and drying stages. The X53/2 wash system is ergonomic and engineered to reduce your shop labor cost without sacrificing wash performance. Simply by loading the parts that need to be cleaned on the turntable, the operator can start the automatic cycle and can return to their task at hand. Overall Dimensions - 76" x 63" x 116"
Overall Dimensions - 86" x 71" x 123"
Overall Dimensions - 94" x 110" x 133"
Load Height 32" 35" 39"
Overall Dimensions 76" x 63" x 116" 86" x 71" x 123" 94" x 110" x 133"
Turntable Dimensions 43" 51" 59"